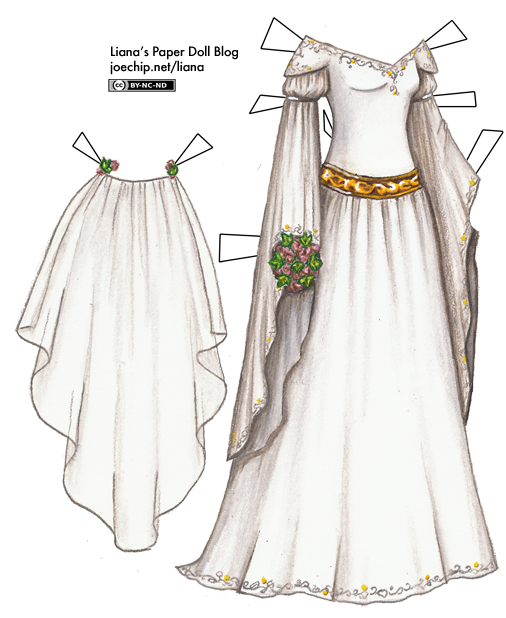 “This may or may not influence what I end up drawing,” I wrote when I put up the wedding dress poll, but then “flowing, fantasy” gowns got over 50% of the vote, and, well, allow me to shamelessly pander for a night. I hope this is the sort of thing that people were envisioning; sorry that the bouquet looks so awkward. I envisioned it as a bouquet of ivy and sweet peas, incidentally, although I got a little tired towards the end. Hey, let’s do a new contest! This one will be easy, so someone’s bound to guess it soon. Last week (from the 8th to the 14th), how many different countries did my site visitors come from? 3) If no one gets the exact date by 9:00 PM EST, June 19th, I’ll pick the closest guess. Don’t worry, trazy, I will color yours next week, after I’m done with my week of weddings. I love when you draw dresses that are fom other times. Especially the 18th and 19th century ones but medieval is great too. Very pretty, but how do you put the veils on the dolls anyway? Um four different countries. Please do your wedding dress! Lindsey, it’s not a complaint, it’s valuable proofreading! :) Try now. Ooh, this is beautiful :) and I’m going to guess, erm… 5 countries. This is so pretty! I’m going to guess. . .18 countries! 14 countries. this is what i imagine thinking flowy wedding gowns. I’m going to guess 10. I’m going to guess 15 countries. I love the dress, I have an obsession with wedding dresses. No offence but my guess is 1 country. wow LOVE it! I absolutely love medieval dresses and this is beautiful! So lovely. Definitely will be downloading this one!